This delicate lace heel looks great for the holidays, but would also be lovely for a wedding, a bridal shower, prom...you name it. I revamped my heel in monochromatic colors, but a two toned heel would look fabulous too! 1. Tape off the heels with painter's or masking tape. 2. 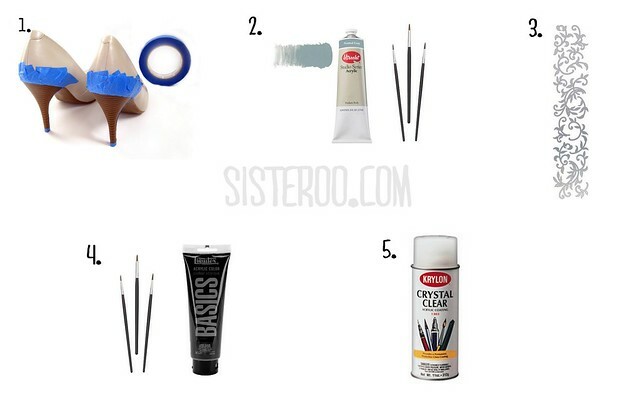 Blend gray and tan acrylic paints to match your shoe color (or try a different color altogether for a bolder look). Paint this on your heel as a base for the silver "lace" to grip. Let dry completely. 3. Find a fun silver lace or leaf sticker pattern at your craft store. I used THIS, but there are quite a few varieties out there. Apply the pieces to your heel in a tight pattern, cutting to fit the shape of your heel. 4. Apply a fine border of black gloss acrylic paint along the edges and in the crevices of your lace pattern to create an "aged" look. Let dry. 5. Apply a light spray of clear acrylic gloss to your heel (making sure to avoid the rest of the shoe). This will set your lace and prevent peeling. I used THIS. 6. Slip on your heels and hit the town! Good luck revamping your holiday heels, Sisteroos! Love it, how does the sealer hold up over time? The one I used ended up yellowing over time and turning sticky, now Im left with a pair of shoes I badly want to fix but am weary about having it go bad again. Kristina: my recommendation--seal a small part of the heel towards the back and take the shoes out for a spin and see what happens. If they don't yellow immediately, seal the whole heel. Check up on the seal regularly, and if you notice any yellowing or wear, re-seal them. Acrylic glosses are prone to deterioration, which is probably what happened to your last pair of shoes. The deterioration definitely accelerates in wet environments, so try to avoid long trips in the rain!